Simon Francis, CEO of integrated marketing consultancy Flock Associates, reveals the best marketing channels to reach car buyers in an increasingly competitive world car market. The automotive category spent about $3.6billion on advertising in the US across the period April-June 2013. For a full marketing spend you could comfortably double that figure. It is the second largest adspend category (behind retail) in the US and it grew at 6.9 per cent quarter on quarter, according to Kantar Media Research. 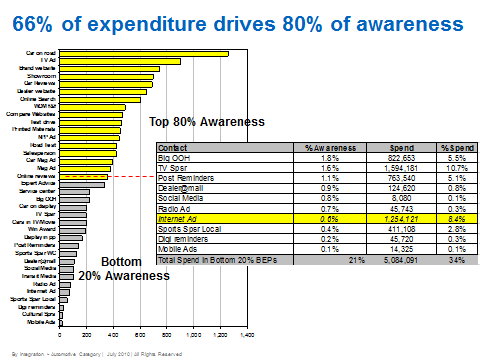 Globally Automotive represents about ten per cent of total advertising expenditure. The automotive category is relatively consolidated versus other categories with large players such as GM, Ford, and Toyota having high shares of category expenditure compared to market leaders in retail or FMCG. Ford is ranked the 4th largest advertiser in the World, GM the 5th, and Toyota the 6th. The Automotive category is marketing intensive and has control over many of the marketing channels it uses to sell cars, from advertising and sponsorships, through digital and CRM, to dealer and experiential. *By having a “common currency” for analysis the client can analyse period-on-period changes, and compare and contrast markets. Integration IMC have worked with 10 different automotive clients across 20 markets, since 2003. 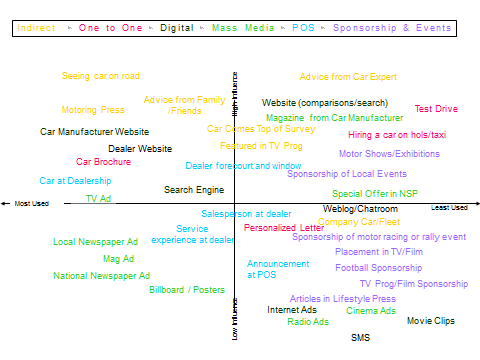 Firstly, when the most influential consumer touch points are ranked, trusted sources of information (car reports etc), 1-2-1 personal experience (like test drives, car rental, seen on the road or dealer forecourt), and digital contacts (like websites and reviews) come out on top. The chart below shows the ranking of each of the touch points based upon their impact. These highly impactful word of mouth touch points are often not fully utilised by the automakers, despite their power. The same is true in many other categories, probably they are hard to control, and measure. It can be seen that “traditional media” which still attracts about 80 per cent of marketing expenditure are amongst the lowest influence touch points. Many automakers are not fully embracing the content marketing revolution, but this is also true in many other categories. Having a clear measure of the roles and competitive pressure on each consumer touch point allows smart decisions to be made. Since 2003 we have seen, unsurprisingly, the influence and importance of 1-2-1 and social media increase by +64 per cent and digital increase by +35 per cent. Also, the digital media are now so creatively ‘engaging’ they rank alongside TV advertising as the most engaging of all media channels. Sponsorship is a great trade tool for hospitality etc, but seems to always rank poorly as an influential consumer touch point. And yet car manufacturers sponsor motorsports teams, and many other sports event and social events as well. These sponsorships often only make any commercial sense when they are extremely well integrated across channels, linking to those more influential channels, as the chart below shows. Interestingly, the consumer touch points rank similarly across different car segments from luxury to economy and from SUV to Mini. However, there are quite large variations by geography. For example Northern European consumers value informational based touchpoints more highly than Latin countries consumers, who value experiential touch points more. Furthermore, since 2003 we have witnessed a growth in the levels of engagement in emerging economy countries – the consumers are now on average +20 per cent more engaged in automotive communication than their developed world counterparts. This has big implications for budget setting across the world, but also for long term planning for marketing. The research also allows the consumer sample to be broken down into the different purchase funnel stages; from those who are not even thinking of buying a car, to those who are researching, and those just about to buy etc. The relevance and power of the different consumer touch points can be seen at different stages of the funnel. 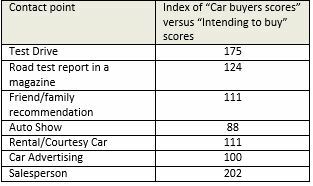 The chart below indexes the scores for different touch points of those actually in the process of buying a car versus those just “intending to buy” at some stage in future. So using this information you can tailor plans to different parts of the purchase funnel, or see how each element of generic plan performs at each stage. Lastly, what is really clever is when costs are attributed to the different touch points. 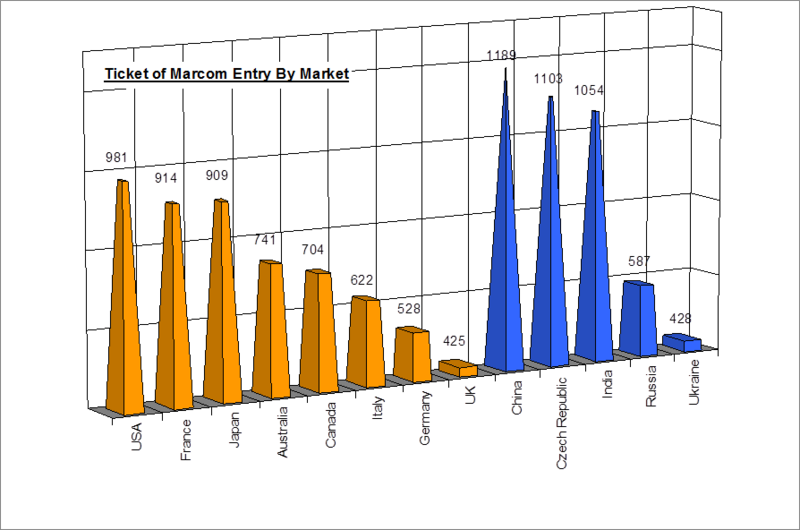 A client can then analyse what return they get for their marketing expenditure by channel. The chart below shows an example of how this analysis can help a client optimise their plans. In this instance the car manufacturer is spending quite a lot of money (c.$5million) on touch points that are not delivering much awareness for them. In the “box” you can see that the client spent $822k on Big OOH advertising which was 5.5 per cent of their budget, but it only yielded a 1.8 per cent share of that brand’s awareness. If this was switched to more productive channels big efficiency gains could be made. Complicated maybe – but we are talking about ten per cent of global ad expenditure.